Earn up to 2,525 reward points. 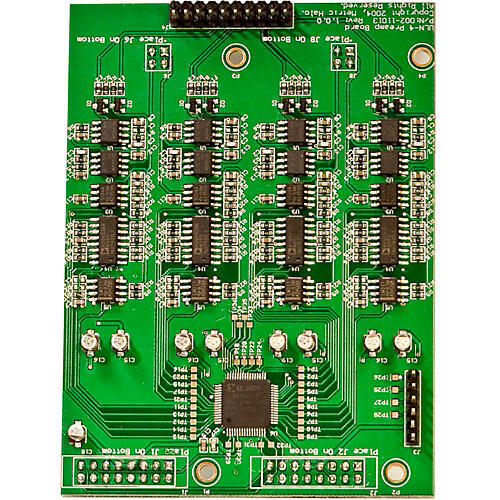 This Kit adds channels 5-8 of ULN-R preamps to a LIO-8 that has an 8 channel DB-25 Input connector board already installed. These are the same preamps as used in the ULN-8. The LIO-8 is available out of the factory with four pres. If you have that one and want to go up to eight pres, this is the perfect item. When Metric Halo introduced the ULN-8, people raved about the sonic quality, the features, and the power of the architecture. Many reports, however, were from studio owners and engineers whose studios were equipped with their own "go to" mic pres, people that use analog consoles, and those that edit but don't record. They loved the ULN-8 too, but didn't need the mic pres. If this describes your situation, but now you would like four pres from the factory, here is your item. The LIO-8 is a great way to upgrade your audio system. Put it between your existing gear and your DAW to get all of the benefits of our analog design, conversion technology and DSP without ripping your room apart. Adding a LIO to an analog console is like buying new converters and getting a digital mixer with total recall for free. Using our ConsoleConnect technology you can insert EQs, compressors, gates, reverbs and more into the v.5 Mixer and have all your routing and settings recalled with your DAW session. Four extra pres for your LIO-8. Order today.